it's been a busy week around here. i've been meaning to post, but there always seemed like there was so much other stuff to be done that this didn't quite make it to the top of the list. so tonight while sam sleeps, and the laundry sits next to me waiting to be folded, i'm going to take the time to do some posting. last friday mike had the day off, so we treated it as a normal saturday and did all our saturday chores. there was much grocery shopping and cleaning to be done, as we were expecting a visit from mike's mom and john that evening and were planning our (now annual) easter gathering with my family on easter sunday. we had a lovely, relaxing evening of take-out and watching "the storyteller" on dvd. the following day, after mike cooked breakfast for us and our guests, we did some serious easter prep. 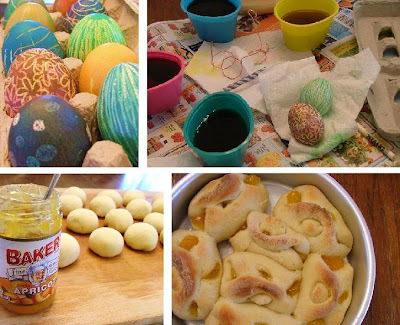 we dyed eggs, and i made kolaches and bread and pre-chopped things for salad. sam helped by watching and reminding me to take breaks and feed him. we topped off saturday evening with dinner out with family at a new restaurant. i was excited to find that there was a section for vegetarian dishes (always a good thing!) by the end of the day, we were pooped.